Size of Male: 57-67 lbs., 18-19 in. Size of Female: 57-67 lbs., 17-18 in. Known as “Am Staf” for short, the American Staffordshire Terrier has had its share of bad publicity as an overly aggressive dog breed. However, you’ll be pleasantly surprised to find them quite docile, sweet and extremely devoted to you. It takes a strict, firm and confident owner to handle them. 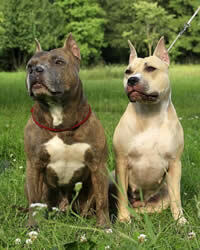 They are also referred to today as one of the “pit bull” type breeds. The early dogs engaged in bull fights before proceeding to the frowned-upon but still notorious dog fights which caught America’s fancy in the late 19th century. Compared to their English counterpart, this dog breed is a tad larger. The young Am Staf is playful, but the adult dog is calm. This dog breed is by nature non-aggressive towards humans. Remember though that even the best behaved Am Staf harbors the instincts of a predator and fighter. It is generally not advisable to have other canines and pets around your home. The breed will not back down on a challenge and will quickly retaliate when provoked. They are either polite or reserved among strangers. The dogs do thrive on human companionship, a lack of which often results in destructiveness. Living Environment – Unless you want to come home to a wrecked apartment, you must provide your American Staffordshire Terrier access to a fenced yard of at least medium sizing, a height of at least 6 feet and a good quality padlock. Even if they can sleep outdoors, the Am Stafs feel more at home when they share the roof (and a warm bed) with their favorite master. Grooming – Dry shampooing is recommended for this low-maintenance, short-coated breed. You must check for red spots as these are indicators of dog allergies. To remove dead hairs, you may use a rubber glove or a damp cloth. The actual volume of shedding may vary according to the climate. In general, this dog breed is considered a low shedder. Diet & Exercise – Am Stafs are voracious eaters. Proper food rationing is necessary to prevent excessive weight gain. The basic dietary ingredient is high-quality meat which ideally should comprise 30 percent of the meal. Fats and fibers are also recommended but in smaller doses. The lively breed requires at least an hour of daily exercise. You may take your Am Staf for a long walk or allow the pooch to roam freely in a secure space. To bond with your pet, plan interactive and vigorous exercises, or have your dog join you in your next outdoor excursion. Health – Emotional stability and canine obesity problems aside, the American Staffordshire Terriers are generally a hardy breed. Experts reveal that the dog’s high pain threshold may actually mask latent health risks. Some cases of thyroid, ligament and dog eye problems are occasionally seen. The American Staffordshire terrier is not intended for the novice pet owner. You must be bossy, confident and firm enough to control these intelligent but willful dogs. In most homes, a professional and expert dog handler often takes charge of the Am Staf’s early obedience classes.